Forty years ago when my Aunt Nee was the pastor of the Holy Temple Church of Truth, an east Baltimore storefront, during testimony service Sister Davis or Sister Cleary would spontaneously lead the tiny congregation in singing, "We're Livin' In the Last Days." "They're calling wrong right. They're calling right wrong. Surely, we're livin' in the last days!" As I listened to Sarah Palin's speech at the Iowa Freedom Summit, I was elated that she once again displayed her exemplary leadership by not joining the chorus of those on our side who believe touting true conservatism is a loser. Palin said we should expose the Left's false premises and educate the public to the benefits and virtues of Conservatism. http://bit.ly/1z1jW8y Wow! How simple and right on target is that? Many Republicans believe we have lost the argument and the only way to win votes is to abandon core principles, surrender and campaign according to the Left's/Democrats' false premises. In essence, they want the GOP to call wrong right and right wrong. For example: Dems argue that requiring a photo ID to vote disenfranchises blacks. A GOP presidential contender suggested that the GOP drop the requirement to show a photo ID to vote, citing that it offends African Americans. http://bit.ly/1K1KpEp Well, as an American who happens to be black, I find the absurd assumption that it is too challenging to ask blacks to find their way to the DMV to acquire a photo ID extremely insulting and offensive. Showing a photo ID is a reasonable common sense solution to combating rampant Democrat voter fraud. The GOP line should be the same for all Americans. If you want to vote, show a photo ID. Period. Some on our side are pandering to Obama's lie that raising the minimum wage will help fix income inequality; once again calling wrong right and right wrong. http://1.usa.gov/15N4Tmy As Palin suggested in her speech, the GOP should be educating voters to the truth; explain why free market solutions are most beneficial to all Americans and the right thing to do. Allowing absurd evil liberal Democrat premises to gain momentum have dire consequences. Their lie that white cops routinely murder blacks lead to the assassination of two NYPD officers. White privilege is another Democrat made-up crisis. It is vital that our 2016 presidential candidate be over the "Obama is black thing," unafraid to deal with Obama as an arrogant lawless tyrant. Terrified of being called racist, the GOP has allowed Obama to act like a far left radical kid in America's candy store; insulated from criticism and rebuke by his black-skin coat of armor. Over the past six and a half years, a socialist/progressive zealot has crept out of the Left's handsome well-spoken black man Trojan Horse. http://bit.ly/1EqjBzd His mission is to destroy America as founded from within; the Constitution, the law, congress, the senate and the American people be damned. Obama's strategy is to federalize as much of our land http://bit.ly/1yNGtFf, economy and lives as possible, thus repealing as many of our freedoms as possible. 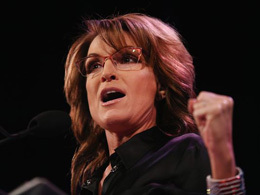 From the beginning, Sarah Palin and the Tea Party tried to warn America about Obama, only to be marginalized in the minds of many by the mainstream media. They branded Palin and the Tea Party stupid, crazy and a bunch of redneck racists hating on our first black president. The mainstream media game plan to defeat us in 2016 is quite simple. First they hammer us with the notion that any GOP candidate who defends the Constitution and advocates for limited government is extreme. Thus, to win, we must embrace liberal Democrat false premises. The MSM then selects a "moderate" candidate which they praise to the hilt. But once we fall for their con and make the moderate RINO our official presidential nominee, they launch a vitriolic campaign portraying our candidate as the devil incarnate. As Palin has stated, in 2016 only a presidential candidate who inspires, pleasantly educates and boldly articulates Conservatism will do.